How to make potato chips? Of cause, potato chips has very well established and standardized process now. No doubt, deep fryer is a most important machine. 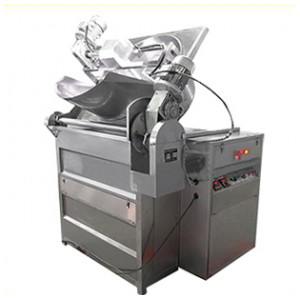 To a small scale chips manufacturing, batch fat fryer is the prefer option. Batch fryer is suitable for a small capacity with new fat-water mixture frying technology. In frying pan, put into fresh and clean water in the bottom and then frying oil or fat are added. Due to different density between water and oil, water will in the bottom of frying pan. In the middle layer of frying oil or fat, there are the heaters, which will us either electricity or gas, LPG as heating source. The fried material like potato chips, French fries, banana chips, plantain chips, potato wedge, finger chips, onion ring etc. will be in the up frying oil layer while deep frying making, residues will be deposited into water through a filter . Frying oil oxidation degree and pollution will be much reducer to result as long service lives and more clean. Thermostats ensure to automatic keep the constant frying temperature in fryer machine during a batch of chips and fries etc. frying process. Cooling devices is equipped in the oil-water interface to keep the temperature different not more than 55℃. Frying fat consumption is unexpected less as the fat in residues will be return to the frying oil before discharge; frying fat consumption is only the absorption of final frying chips or fries. Due to automatic control the frying oil temperature and water, power is saved of 50%.